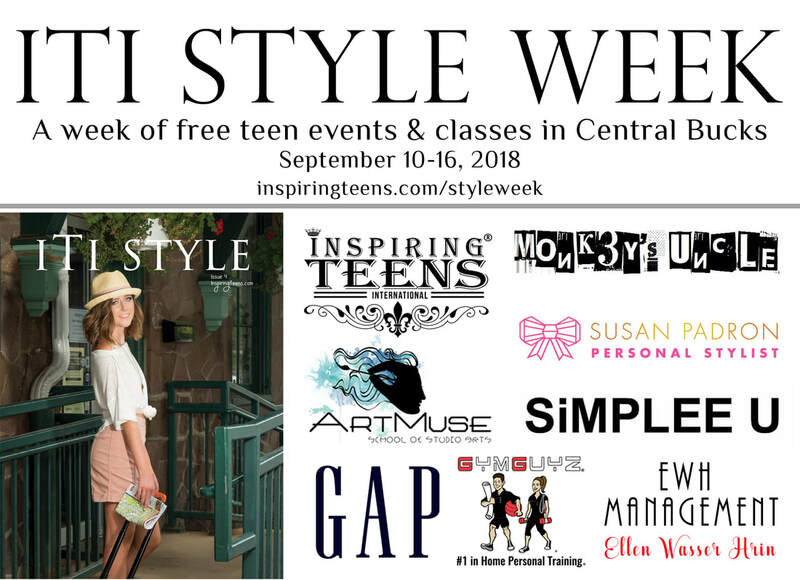 Welcome to Inspiring Teens STYLE Week! *These are free community events for teens, however some events/classes have a cap of number of teens for the amount of space provided, and some events allow for tweens as well as their families. Please notice which is which so that if your teen is NOT a teen, they are not signing up for something that is not age appropriate. Once the cap is full we will put a *FULL* next to it. You can still register for it for a next seat in line in case of cancellations, but only those registered with confirmation codes will be granted access into the events/classes. September 10 Monday 5:30-7:30 GAP Photo Shoot - Taking place at GAP: 17 S Mainstreet, Doylestown, PA for all ages. Gap has clothes for all so bring the whole family and try on GAP's new fall line and get a GAP family styled shoot, or just a photo shoot for you! Whether you want to see GAP's newest line of clothing styles, need an updated headshot, want to find out the best looks for your body type or want to try out some basic modeling posing, we're all here to help! *This event has no limit and you can stop in for it any time between 5:30-7:30, but registered guests who want to be photographed in their GAP styles must be signed in by 7:00pm. Susan Padron is a certified personal stylist, fashion stylist, and style blogger from the Greater Philadelphia Area. Susan helps her clients curate a wardrobe that both defines their personal style and fits seamlessly into their lifestyle. She has been featured on CBS3 Philly, Looping Up, Her Story, The Philadelphia Inquirer, Bustle, The List, and her work has been published on several major wedding blogs. *These classes are limited to 20 students each. A Mother-Agent to models placed all over the world, Ellen has been in the industry for 20+ years and knows all the ins and outs, regardless of your age, height, and specific looks. She's taught runway to talent who have gone on to open for Fendi, taken in talent who has gone on to be the face of Chanel, and will have so many more stories and words of advice. *Registered students will receive an email for what to bring. *This class is limited to 30 students. September 12 Wednesday 5:30-7:30 Fashion Art Illustration for 7-12th Grades with Kristy DeFlores at Art Muse: 123 S. Main Street Doylestown. In this intro to Fashion Art Illustration, Kristy will teach you the fundamentals of designing on paper. *This class is limited to 18 students. September 13 Thursday 5:30-7:30 Fashion Photography for 7-12th Grades with Leslie Conway at Inspiring Teens Studio: 1243 Easton Road Suite 201 Warrington, PA. In this intro to Fashion Photography, students will study what separates a fashion photograph from a portrait, and how styling, posing, and lighting can make or break an image. *This class is limited to 15 students. *FULL: September 14 Friday 5:30 - 7:30 Hair and Make Up Styles for Teens in 7-12th grades at Simplee U Hair Salon: 109 South Main Street Doylestown, PA. Allison Booth, owner of Simplee U, will go over great techniques for hair and make up for your every day styles and upcoming homecoming looks. Practice these techniques to perfection and walk away looking like a million bucks! *Registered students will receive an email for what to bring & receive a free gift upon arrival. *This class is limited to 10 students. September 15 Saturday 8:30-9:30 Workout & Yoga for all ages with Mark Vanzura from Gym Guys at Inspiring Teens Studio: 1243 Easton Road, Warrington, PA. Bring the family to start your day off with an amazing workout by Bucks County's best! September 15 Saturday 11:00 - 1:00 Open House/ Meet the Team for 5-12th grades at Inspiring Teens Studio 1243 Easton Road, Suite 201 Warrington, PA. Stop in any time during those hours and meet our team, tour our studio, enjoy some snacks, ask some questions, jump in our photo booth, and see how you can be an essential part of the next Issue of Inspiring Teens Magazine or iTi STYLE Magazine! *This event size is unlimited, but the first 20 registered (non member) teen guests will receive a free gift upon arrival.